FARRO ALL THE WAY!! #PROTEIN/FIBER GALORE! Once again, I jumped overboard. I hit the Mediterranean coast. There, I discovered a grain that has been around for many centuries. It’s hearty and quite satisfying. Moreover, it’s loaded with an abundance of protein and fibers. Any meal that can fill me up, count me in! I didn’t have to travel to that part of the world. Thanks to my neighborhood supermarket, I was able to fetch an atypical whole grain that has been around for eons. It’s called farro. Because of the removal of the husk, this particular version (Italian) takes approximately 20 to 25 minutes to cook and yet still holds a crunchy bite. 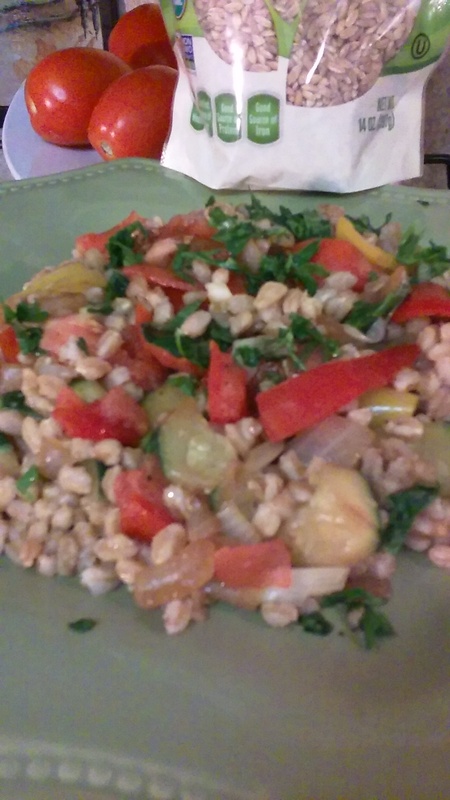 The beauty about farro is that it can be had either savory or sweet/hot or cold. It has a rice-like appearance and will take on any flavor that is cooked with it. Thus, I decided to substitute my morning’s oatmeal for this ancient grain. And oh, my palate was super-excited. I made sure to cook the sufficient grains from the previous night to do double-duty: breakfast (hot cereal) and dinner(salad). Brought 2 cups of water to a boil with a pinch of salt. 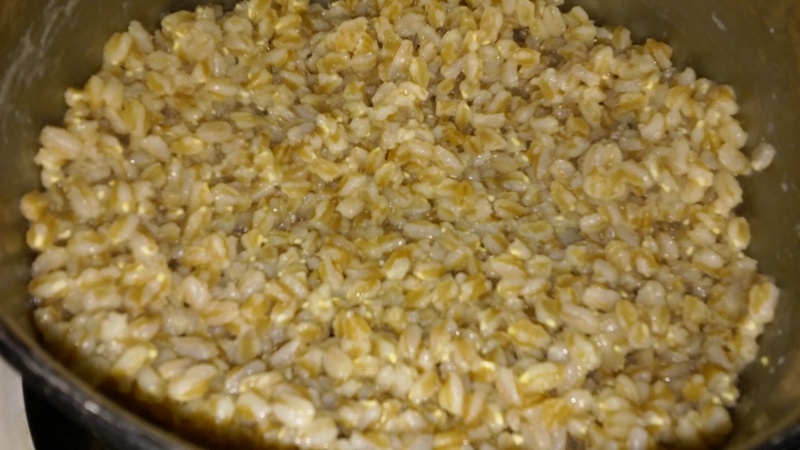 Rinsed 1 cup of farro under cold water and added to boiling water. Stirred and allowed same to cook under low to medium heat until all the water was absorbed. Added a splash of whole milk to cereal along with a splash of vanilla and sprinkle of cinnamon. Sweetened with brown sugar to taste. 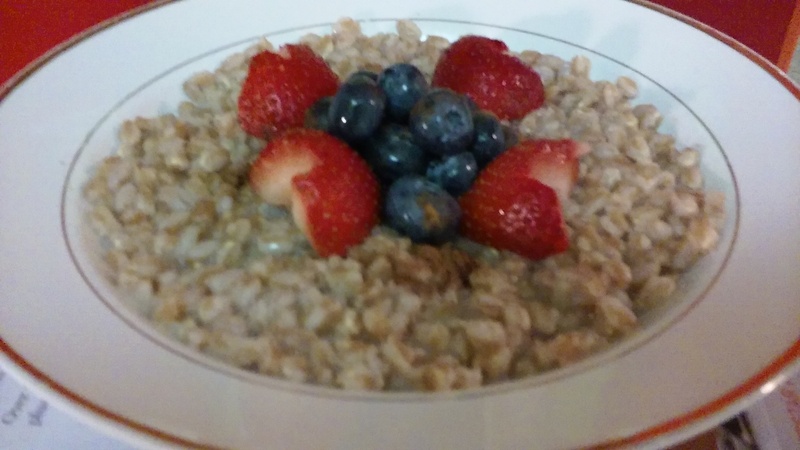 Topped cereal with fresh blueberries and strawberries. Sauteed mini bell peppers, onions, chopped zucchini, crushed garlic and chopped tomatoes in a drizzle of olive oil. Added to cooked farro and folded and combined all ingredients. Salad can be consumed warm or at room temperature. The addition of any choice protein: seafood, poultry or meat would be a great accompaniment.